The world population is constantly increasing & was estimated to be approximately 7.5 billion in April 2017. Women accounted for 49.6% of the total world population. They form an important part of the society and hence, the concerns regarding women’s health are pivotal for the overall well-being of the society. Women have higher life expectancy than men but a longer life does not ensure a healthy life. Women health has long been a neglected issue, worldwide. Women undergo several biological, physical & psychological changes during their lifetime. These reoccurring changes, along with ageing, consequently lead to several health issues and related problems. The world population is ageing faster and women accounted for 54% of the population belonging to the age group of 60 years or over, in 2015. This percentage is expected to increase in the coming years. The different health issues that women face include infertility, hormonal changes, postmenopausal disorders and urinary infections, among others. The use of contraceptives by women is another issue that needs to be addressed. The market analysis includes an in-depth examination of the key ecosystem players and the key strategies & developments taking place in this market. Additionally, it includes the market dynamics (market drivers, opportunities and challenges) and industry analysis. The purpose of the study is to gain a holistic view of the women’s health market in terms of the various factors influencing it, such as recent trends, technological advancements, and regulatory aspects of the market. The scope of this report is centred upon conducting a detailed study of the solutions allied with the women’s health market. The market has been segmented into ‘application’, ‘product’ and ‘geographical regions’. The report presents the reader with an opportunity to unlock the comprehensive insights with respect to the market and helps in forming well informed strategic decisions. The research uncovers some of the substantial parameters that must be taken into consideration before entering into the market. 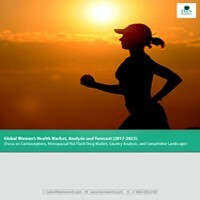 This research report aims at answering various aspects of the global women’s health market with the help of the key factors driving the market, threats that can possibly inhibit the overall market growth, and the current growth opportunities that are going to shape the future trajectory of the market expansion. The study considers the growth-share matrix model for a comprehensive study of the global women’s health market and assesses the factors governing the same. • What are the major market drivers, challenges and opportunities in the global women’s health market? • How did the women’s health market evolve in the past and what is its scope in the future? • What is the market share of the leading segments and sub-segments of the global women’s health market in 2016 and 2023? • How will each segment of the global women’s health market grow during the forecast period and what will be the revenue generated by each of the segments by the end of 2023? • How will the industry evolve during the forecast period 2016- 2023? • What are the key developmental strategies that are being implemented by the key players to stand out in this market? • What are the treatment options for postmenopausal symptoms? • What is the estimated value for menopausal hot flash market? • What is the value of different types of contraceptives in the market? • What will be the value of hormonal contraceptives segment by 2023? • Which geographical location will contribute to the highest sales of the products? The key players which have been significantly contributing to the Women’s health market are Neurocrine Biosciences, Gedeon Richter Plc, Ferring Pharmaceuticals, enteris BIOPHARMA, Bayer Healthcare, F. Hoffmann-La Roche AG, Pfizer Inc., Novo Nordisk, Allergan, Plc, Radius Health Inc., Agile THERAPEUTICS, Teva Pharmaceutical Industries Ltd., Valeant Pharmaceuticals, Vertical Pharmaceuticals, and Veru HEALTHCARE, among others. 9.23. VALEANT Pharmaceuticals International Inc.
31 Overview: NEUROCRINE BIOSCIENCES, INC.
37 Overview: Radius Health Inc.
40 Overview: VALEANT Pharmaceuticals International Inc. The concern regarding women’s health is pivotal for the overall well-being of the society. Yet, it is an issue that has always been neglected due to several sociocultural factors prevailing in the society. The advent of the 21st century witnessed a sharp rise in the level of awareness among people regarding women’s health, the focus is now on better education and accessibility of services in different countries. As estimated in April 2017, the total world population accounted for approximately 7.5 billion out of which women accounted for 49.6%. Though it has been observed that women live longer than men, a longer life does not indicate a healthy life. Women undergo a lot of hormonal, emotional and physiological changes during their lifetime. The focus is now on providing better education and accessibility to services in different countries across the globe. The purpose of the study is to gain a holistic view of the women’s health market in the terms of various factors influencing it, such as recent trends, technological advancements, and the regulatory aspects of the market. The scope of this report is centred upon conducting a detailed study of the solutions allied with the women’s health market. The market has been segmented into ‘Application’, ‘product’, and ‘geographical regions’. The global women’s health market was estimated at $30.88 billion in 2016 and is estimated to grow over $42.12 billion by 2023. The rising geriatric population among women leading to higher incidence rate of menopause and related diseases is the major factor driving the growth of the market. With women becoming more career oriented and marriages being delayed, the infertility rates have been increasing. Other factors affecting women health include stress and changing lifestyle. The global women’s health market can be segmented on the basis of applications, such as reproductive, menopausal, urological & others. The major contributor to the market growth, in 2016, was the contraceptives. The contraceptive market was estimated at $15.97 billion in 2016. Based on the product, the market has been segmented into drugs & devices. North America was the major revenue contributing region, by geography, because of the rising population of elderly women and higher life expectancy leading to the increased prevalence of menopausal conditions and osteoporosis. It was estimated at $13.64 billion in 2016 & is expected to reach $17.36 billion in 2023. The region also exhibits a higher prevalence of obesity which leads to the higher prevalence of infertility. It has been observed that more menopausal symptoms were reported among the American women. The highest CAGR is expected to be of Latin America with a value of 7.1%, during the forecast period 2017-2023. The emerging opportunities for the women’s health market are the treatment options for various conditions like PCOS, reproductive health diseases, and endometriosis, among others. The market has not witnessed innovative and breakthrough therapies in the recent years. The rising emphasis on the wellbeing of women, the increased awareness about contraceptives and pharmaceuticals and use of natural hormonal preparations are other factors which will guide the growth of the market. The report provides in-depth SWOT analysis of different key players of the market, supported by a financial summary of each of the players. Some of the key players are Neurocrine Biosciences, Gedeon Richter Plc, Ferring Pharmaceuticals, enteris BIOPHARMA, Bayer Healthcare, F. Hoffmann-La Roche AG, Pfizer Inc., Novo Nordisk, Allergan, Plc, Radius Health Inc., Agile THERAPEUTICS, Teva Pharmaceutical Industries Ltd., Valeant Pharmaceuticals, Vertical Pharmaceuticals, and Veru HEALTHCARE.